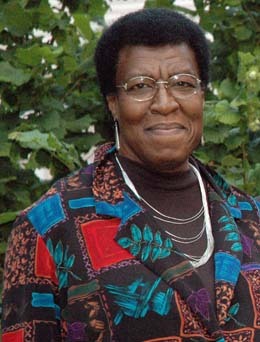 Octavia Estelle Butler is “the first African-American woman to gain popularity and critical acclaim as a major science fiction writer” (Hine 208). She was born on June 22, 1947 in Pasadena, California, to Laurice and Octavia M. (Guy) Butler. Butler was the only child of five pregnancies that her mother was able to carry to term. Her father, a shoeshine man, died when Butler was very young. Most of her memories are actually stories that she heard from her mother and grandmother. Her mother and she lived in a very racially mixed neighborhood. The unifying factor was the struggle to make ends meet. Butler “never personally experienced the more rigid forms of a segregated society” (Smith 144). Butler was very shy in school, and describes herself as a daydreamer. These factors made it very difficult to succeed in school. She overcame dyslexia, and “began writing when [she] was 10 years old…to escape loneliness and boredom.” (Locher 104). At age twelve she became interested in science fiction. Butler received an Associate of Arts degree in 1968 from Pasadena City College. She then attended California State University, Los Angeles and the University of California, Los Angeles. She credits her success to nonacademic programs, though. Two of these programs are the Open Door Program of the Screen Writers Guild of America and the Clarion Science Fiction Writers Workshop. While attending school Butler held down a lot of odd jobs. Her work experiences come through in the character of Dana in her novel Kindred (as quoted above). Butler also spends time researching developments in biology, the physical sciences, and genetics. Butler has won several awards for her writing. In 1984 she won a Hugo Award for her short story, “Speech Sounds.” In 1985 she won the Hugo for her novella “Bloodchild.” “Bloodchild” also won the 1984 Nebula Award. The Hugo and Nebula Awards are considered science fiction’s highest awards. They are decided on by other science fiction writers and fans. In 1995, Butler won the MacArthur Foundation “genius grant” which pays $295,000 over 5 years. Butler’s patternists series, published between 1976 and 1984, tells of a society that is run by a specially-bred group of telepaths. This is an elite group who are mentally linked to one another in a hierarchical pattern. These telepaths are trying to create a superhuman race. This series includes the books: Patternmaster, Mind of My Mind, Survivor, Wild Seed, and Clay’s Ark. Patternmaster deals with the struggle between brawn and brain. It also comments on class structure and the role of women. Wild Seed “incorporates a great deal of the Black experience, including slavery” (Hine 209). Dawn, Adulthood Rites, and Imago are the three novels that make up the Xenogenesis trilogy. These stories are about the near destruction of humankind through nuclear war and gene-swapping by extraterrestrials. The extraterrestials observe the humans as being hierarchical, which cause them to be prejudiced, and to have class divisions and conflict. These characteristics make it inevitable that mankind will eventually destroy itself without the aliens’ help. Octavia Butler has been well received by the critics. Burton Raffel had this to say about Butler’s work: “initially drawn on by the utterly unexpected power and subtly complex intelligence of her extraordinary trilogy Xenogenesis, but sustained and even compelled by the rich dramatic textures, the profound psychological insights” (454) “Butler’s work is both fascinating and highly unusual” Rosemary Stevenson writes; “character development, human relationships, and social concerns predominate over intergalactic hardware” (208). “I’m not writing for some noble purpose, I just like telling a good story. If what I write about helps others understand this world we live in, so much the better for all of us,” Octavia Butler told Robert McTyre. “Every story I write adds to me a little, changesme a little, forces me to reexamine an attitude or belief, causes me to research and learn, helps me to understand people and grow…Every story I create, creates me. I write to create myself” (Stevenson 210).